Register Now & Start Playing! You can throw CHALLENGES to your campus mates/peer groups/friends/coaching friends for games you play (only on CAT topic and its sub-topics) Challenges will be counted only when the game has been completed by you and the person you challenged. Don’t quit in between. REFER as many friends you can who should play minimum one game with you to be counted as successful. Minimum 10 games must be played while maintaining a success rate of 50%. Successful Referrals will be counted when your friend has downloaded the EduThrill App and played at least one game. Disclaimer – If any unfair practice found during the contest, EduThrill will take the disciplinary action and disqualify the candidate. Q1. Where I have to participate for the challenge? Q2. Where can I see the reminder notifications of the challenge? Q3. What type of questions will I have to solve in this challenge? Q4. Will I receive the results of the challenge? If yes, when? Yes, LIVE scores allow you to see the results of every game you play. And, we will be sharing LeaderBoard, weekly on social media. Q5. Where can I view the solutions for the problems of this challenge? Answers are provided once the game is over. Q6.In case of any error/issue, where can I report the query? Q7. 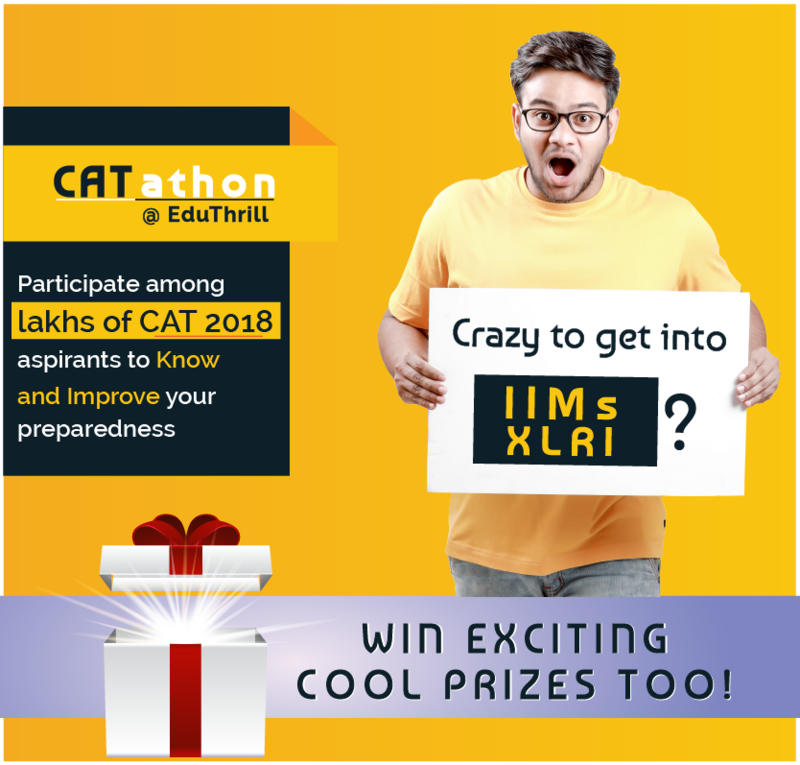 Is this contest only for CAT 2018 aspirants? This contest is open for all the CAT/MBA aspirants. Q8. I came to know about the contest late and could not start participating on September 24, do I still have chance? Absolutely, the contest is structured in a way that you can start participating any day during the period of the contest and still have a good chance to win. All you have to do is start playing games, where each game takes 2-3 minutes, and maintain a good success rate. So, if you are a CAT/ MBA aspirant, this contest is yours to Win! Q9. When one will receive the prizes? Once the winner is declared for a week, EduThrill Team will coordinate with them for their address. Post this, we will take 10 working days to dispatch prize. Q10. If I won a weekly prize once, will I be eligible to win again? Cumulative scores will be considered. So, if you score x marks in 1st week, and y in 2nd week, total score will be x+y. Then if you score z score in week 3, total score will be x+y+z.